News broke on Monday evening, September 30, 2013, that two U.S. Marine Corps generals were being forced into retirement for failing to take “adequate force protection measures” in a devastating Taliban attack on a southwestern Afghanistan base a year ago. 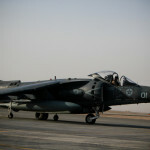 I immediately thought of the deadly attack on VMA-211, the “Wake Avengers,” at Camp Bastion in September 2012 that killed two of the team and destroyed several Harrier fighters on the ground. The news reports did not mention the Wake Avengers by name, but the details confirmed the connection. On September 14, 2012, fifteen Taliban attackers cut through an unguarded perimeter fence at British-run Camp Bastion in Helmand province and infiltrated the base. Using rocket-propelled grenades, they destroyed six of VMA-211’s Harrier fighters and damaged others. The Wake Avengers’ commander, Lt. Col. Christopher K. Raible, and Sgt. Bradley W. Atwell lost their lives in the ensuing battle, and fourteen of the fifteen attackers were killed. Following the investigation by the U. S. Central Command that commenced in June of this year, commandant of the USMC Gen. James Amos asked for the retirement of Maj. Gen. Charles Gurganus and Maj. Gen. Gregg Sturdevant, citing the “timeless axioms” of command responsibility and accountability. The investigation showed that General Gurganus, who was then American commander in that region of Afghanistan, underestimated the risk of Taliban attack. Both he and General Sturdevant, commander of Marine aviation in the region, bore ultimate responsibility for protection of forces there, in spite of troop reductions that left some of the camp perimeter unguarded and VMA-211 vulnerable to attack. Marine Attack Squadron 211, based in Yuma, Arizona, has a long, proud history that is firmly rooted in the legacy of Wake Island. In late November 1941 the squadron then known as VMF-211 departed Pearl Harbor on the USS Enterprise bound for Wake. On December 4 the twelve-plane squadron of Grumman F4F fighters flew off the carrier and landed on Wake Island’s narrow crushed-coral runway to defend the valuable atoll from potential attack. Despite little training on the new planes and lack of instruction manuals, spare parts, armor, and bomb racks, the pilots and ground crew put their skills and ingenuity to work and soon had the Wildcats on patrol. On December 8, 1941, war came to Wake. With news of the attack on Pearl Harbor that morning (December 7, across the International Date Line), VMF-211 had a war patrol of four Wildcats scouting the airspace high above Wake, eyes peeled for Japanese attackers. The remaining eight fighters sat on the airstrip with ground personnel scrambling to ready them for service. Just before noon, undetected by the patrol aloft over cloud cover, Japanese attack bombers swept in low over Wake dropping hundred-pound fragmentation bombs on the airfield taking out seven of the eight exposed Wildcats and two huge fuel tanks. Terrible carnage ensued at the airstrip where over half of the fifty-five ground crew members and six squadron pilots were wounded or killed by bombs, bullets, or fire. 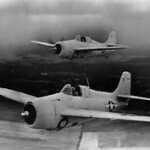 Under the leadership of Major Paul Putnam, VMF-211 rapidly regrouped to meet the challenge and two of the remaining intact Wildcats rose to the sky to intercept the next day’s attackers as gun batteries fired below. The Japanese returned daily for over two weeks to bomb and strafe Wake, meeting fierce resistance every time. The defenders repelled an attempted land invasion less than a week into the siege and the Wildcat pilots chased down the retreating ships, adding a destroyer and submarine to their rising tally of downed enemy aircraft. Despite the valiant efforts of the skilled pilots and the combination military-civilian crew that worked day and night to keep the last Wildcats flyable, Wake’s air defenses ended on December 22 with the loss of the final two fighters. VMF-211’s remaining personnel joined the ground defenses and fought as Wake fell to an overwhelming land invasion the next day, December 23, 1941. Many died in the final battle; the survivors were captured as prisoner of war. 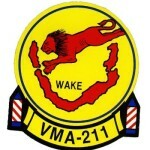 The rear echelon of VMF-211 was subsequently transferred from Hawaii to Palmyra Island (location of another CPNAB contract project) where they took on the name “Avengers” in honor of their fallen comrades. Flying the Corsair in numerous Pacific campaigns during the war, VMF-211 built on their proud tradition. In 1952 the unit was designated VMA-211 and has continued a decades-long run as an operational squadron in many of our nation’s conflicts. Reflecting on the historical events on Wake Island and of the attack on VMA-211 at Camp Bastion last year, I can’t help but think of the parallels. The accusations that brought down two Marine Corps generals yesterday – underestimation of the risk of attack in a region and failure to provide adequate force protection measures – apply as well to the situation in the Pacific in early December 1941. At that time no one bore specific blame for Wake Island or other outlying Pacific targets, but Admiral Husband Kimmel and General Walter Short took the fall for Pearl Harbor for those very reasons. Then as now a complex stew of inefficiencies and attitudes underlay the situation, not to mention the acknowledgement that the enemy’s attack was well planned and well executed. The bottom line, however, was and is command accountability and responsibility.